Hello and happy Monday to you all!! Hope you had a fan-tab-ulous weekend. We had a great one here. The boys went for a 40 mile bike ride and came back exhausted and hurt!! Buddy practiced camping at his grandparents house over the weekend. He loved it. He woke up this morning on the side of the tent!! LOL He fell off the air mattress, sometime in the evening!!! 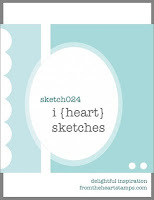 Today, at From the Heart, we have a new weekly sketch for you. I know Father's Day is over, but I've had this image colored for weeks and it kept screaming at me!! So I put this weeks sketch to great use! Check out those cool ties!!! Which one would you wear?!? I used some fun paper by Fancy Pants: Swagger. Love the color palette and patterns of the entire pack. Image is colored using Copics, cut with oval die and edged inked with distress ink. Then matted on kraft cardstock which was die cut with romance oval and ink with distress ink as well. I followed the sketch exactly as shown, I just changed the placement of my brads. This is very pretty, Calypso. 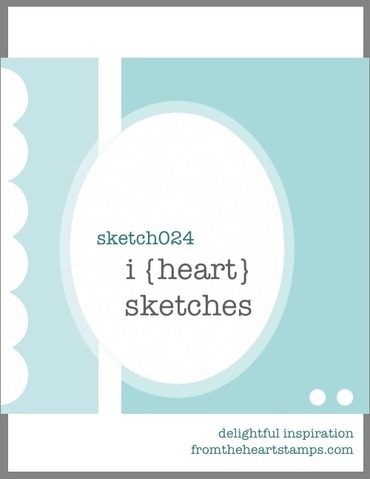 The colors are perfect for a masculine card and great take with the sketch !! It has lots of details and the color is great!